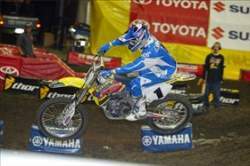 Danny Smith had never raced an arenacross before this weekend, but this morning he is the points leader in the Toyota AMA Arenacross Series, which kicked off in Des Moines, Iowa, at the Wells Fargo Arena. There was a record rider turnout, full stands, and an easy track. Smith won the first night and was third the second night. He is just three points ahead of Greg Schnell. Brock Sellards, who was just there for this one race since his deal with BooKoo is for supercross, is tied in points with Matt Barnes for third. A lot has changed in arenacross for this year. 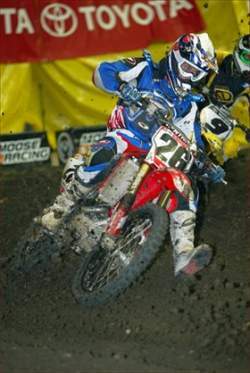 This was the first race in the new era of the AMA using arenacross as a qualification series for a supercross license endorsement (along with Loretta Lynn’s). Regionals are gone, and the Lites class is organized in four regions: East, West, North, and South, much like Lites are in East and West regions in supercross. The last big change—and the most visible—is that the tracks are easier. There were plenty of spills anyway, but it was a pretty safe weekend. Some riders had the supercross endorsement in mind, but for this weekend, the guys who have already been there and done that dominated. Even defending champion Chad Johnson, a top pick in the bench racing in the pits, had a disappointing 6-7 weekend. 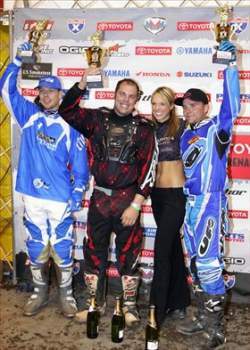 The talent was strong, with Smith and Buckelew racing for Tuf, Chad Johnson and Greg Schnell for Junior Jackson and Rockstar, plus Sellards, Reynard, Keith and Kevin Johnson, Scott Metz, and the rock-and-rolling Blair brothers. Rider turnout was so high that the afternoons were busy with qualifiers, and the pits had a lot of disappointed faces. Even Reynard missed the night show on the first night, and so did Shane Bess. The path to supercross is there, but there are some pretty tough guys in the way! The whoops were easy and leveled the field, making the start more critical since passing got harder to plan. The start was long and flat with a tight 180 at the end, where it was common to see Tuff Blox and riders tumbling. Gray Davenport of Utah won the first Lites main ahead of Kody Molitor and Cory Green. The Lites class went to Molitor, Bruce Dehn, and Kevin Hoge on the second night. Local favorite Teddy Maier got the first AX holeshot of the night, just ahead of Smith, but Chad Johnson was a victim of the tumbling tuff blocks and got up last. He caught back up to sixth. Smith passed Maier and had an uneventful win, with Maier holding on to second ahead of Schnell. Reynard bounced back from missing the night show on night one by winning the second night—via the last-chance qualifier! He got bumped off the track in his heat but won his LCQ. In Saturday’s main, Schnell got the holeshot with Reynard right behind him. The two raced a couple of laps before Reynard got by for the win. Chad Johnson’s start was a little better than mid-pack, but he wasn’t able to make it up. Smith just had to get by Kevin Johnson for third. Reynard won, Schnell was second, and Smith third. Shane Bess had trouble adjusting to his bike on the first day and didn't make the night show, and he crashed out of his heat in night two. The Air Force FMX team is back this year, and the tricks are pretty standard, but they are a lot better at it this time. Spectator turnout was really good. Des Moines is a great town for arenacross anyway, but one local commented that he had never seen the lot outside so full. Next week the series moves on to Albany, New York, for round two, and the pressure is on for Chad Johnson to win back the honor for the arenacross specialists.